Familiar lyrics to a song I sang as a young child. The lyrics go on to say that the weak should proclaim strength and the poor should proclaim riches because of all the Lord has done for us. So, in that, and in all things, Give Thanks. But as we utter these words, have they become empty somehow? Do we truly feel grateful for our gifts, for our blessings, in all things and in all circumstances and in all situations? It’s a commandment of the Lord to give thanks and to offer up praises, even when our hearts are far away. Even when thanksgiving may be the very last things on our minds. 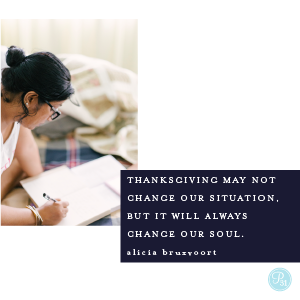 Thanksgiving may not change your circumstances, or change your current situation, but it may very well change your outlook, the attitude of your heart, your well being, and your very soul. I read the below devotion last week and was personally challenged to prayerfully consider what the role of thanksgiving plays in my own personal life. How I relentlessly pursue true and everlasting joy on a daily basis. How I put it into practice and how it influences my faith walk. “Years ago, I hid 1,000 pennies around our home. A very happy and blessed Thanksgiving to you and yours! But, may the premise of this holiday live in our hearts each and every day. They are everywhere this season! And, I for one, love this trend! Mostly because I love a good, soft, cuddly T shirt, and if they are constructed and made well, there is no limit to how you can style them this fall & winter! …but, even for the office? It might feel like you are breaking the rules a little bit, but that’s what fashion is all about! It’s fun to break the rules every now and again. 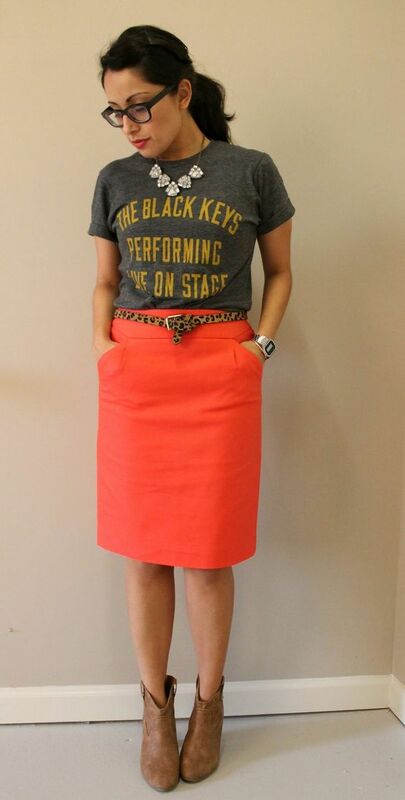 So, here are a few styling tips for adding those trendy graphic tees into your fall & winter professional wardrobe. Tip No.1 : Size up! Go up just 1 single size on these tees and they become much more versatile to tie on the side for a more casual silhouette, tie in the back for a more fitted look, or you have a bit of added length to tuck in a skirt or pants. Tip No.2 : Pair with a tailored blazer, jacket, or cardigan sweater. And, it’s really as simple as that and you are perfectly polished for a business meeting or professional luncheon. Tip No.3 : Put a collared shirt underneath to elevate the look. 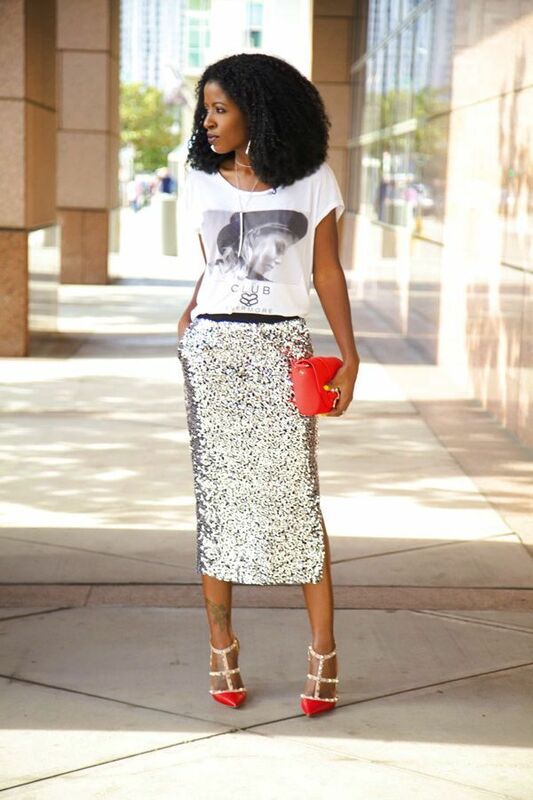 With a skirt, or pants, this look is a winner! Tip No. 4 : Use it as a shell with a suit rather than a blouse. It’s the perfect somewhat quirky and unexpected layer underneath a classically cut suit. Tip No. 5 : Pair with the unexpected! Tulle, Animal Print, Lace, Sequins, and even Leather! I just love the idea of the unexpected. These classic wardrobe staples will elevate your graphic tees for work, a night out with the girls, or for just about anywhere you want to go! Globetrotter Graphic Tee, comes in Ciao! and Merci! Personal style is all about fun and being true to you!